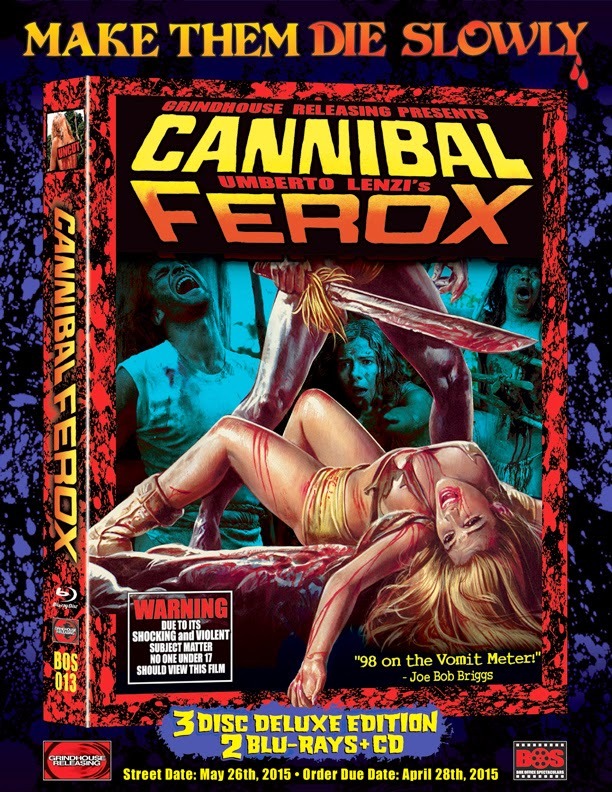 Film-Arcade.net: Grindhouse Releasing Announces Deluxe Blu-Ray of Umberto Lenzi's "Cannibal Ferox"
Grindhouse Releasing Announces Deluxe Blu-Ray of Umberto Lenzi's "Cannibal Ferox"
Grindhouse Releasing recently released information for the upcoming deluxw Blu-Ray release of "Cannibal Ferox". The 1983 cult film stars Giovanni Lombardo Radice, Lorraine De Selle, Danilo Mattei. The deluxe Blu-Ray includes 3 disc deluxe edition - 2 Blu-rays + CD, Original UNRATED, UNCENSORED director’s cut, Spectacular new 2K transfer - scanned from the original camera negative, SHOCKING deleted footage - lost for over 30 years!, Breathtaking digital stereo re-mix by Academy Award winner Paul Ottosson, Candid and shocking audio commentary by director Umberto Lenzi and star John Morghen, Provocative, in-depth interviews with director Umberto Lenzi, stars Giovanni Lombardo Radice, Danila Mattei and Zora Korowa, and special effects master Gino DeRossi, EATEN ALIVE! THE RISE AND FALL OF THE ITALIAN CANNIBAL FILM - all-new feature-length documentary containing interviews with Umberto Lenzi, Ruggero Deodato, Sergio Martino, Giovanni Lombardo Radice, and Robert Kerman, Extensive gallery of stills and poster art, Liner notes by legendary 42nd Street historian Bill Landis (author of SLEAZOID EXPRESS) and Eli Roth (director of HOSTEL and THE GREEN INFERNO)and BONUS CD - original soundtrack album by Budy-Maglione - newly remastered in stunning 24 bit/96khz sound from original studio master tapes, and including never-before-released alternate takes and other surprises. "Cannibal Ferox" Deluxe Blu-Ray hits retail on May 26th. Here it is! The original uncensored, unrated director’s cut of one of the most notorious and violent films of all time. BANNED in 31 countries, CANNIBAL FEROX assaults your senses as a group of Americas lost in the jungles of Amazonia experience brutal retribution at the hands of blood crazed cannibals. Shot on location in the savage Amazon wilds of South America, CANNIBAL FEROX IS ONE OF THE MOST VIOLENT AND SHOCKING FILMS EVER MADE. There are at least two dozen scenes of barbaric torture and sadistic cruelty graphically shown.